These tenacious short-winged hawks are commonly used in the sport of falconry. They frequent well-wooded habitats and hunt their prey close to the ground in a short sharp tail chases. 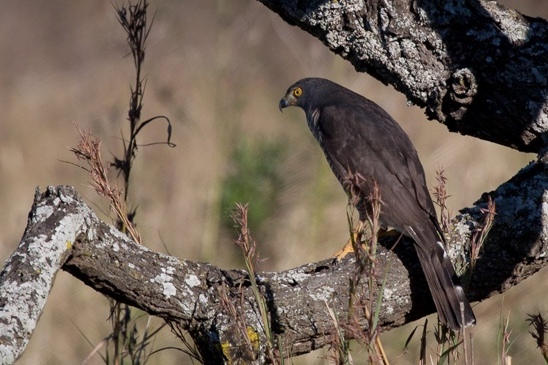 African goshawks abound in KwaZulu-Natal and are seen hunting in and around suburban gardens. The breeding pair can often be heard ‘chipping’ to each during early morning display flights. An African goshawk female called Rox (short for Roxette) flies daily in our demonstrations. Rox is a captive-bred African Goshawk female (Accipiter tachiro). She was bred at the African Bird of Prey Sanctuary from two non-releasable parents. Her mom has one wing and her dad has one eye, but they breed successfully every year! She completed a season of hunting before retiring to a more sedate lifestyle of flying in displays. Rox is queen of the short, sharp dash and shows off her maneuverability and hunting skills by chasing a ground-lure across the arena. Beware too the brave lizard, butterfly or bird that ventures into her flying arena!